Lighting-Gallery-net - good ol' mercury vapor/GE 400w R60 /C merc flood what a beauty! GE 400w R60 /C merc flood what a beauty! Finally got a beautiful merc reflector lamp in /C. Has no dimple, the arc tube support is clamped onto the stem. Unfortunately its a little bent, but still functional. I didn't know they had /c reflectors. Nice katch, Dave. They made em in /W also. Up to you guys to find one! The money I would pay to see a /W version of these in action. Where were these used? Was a 400w Metal halide version ever made? Great find. Was this on eBay? OOO nice find! Where at? Guys yes I got this off the bay, same seller who also sold me the GE half coated BT-56 lamp. And yes a 400w MH R60 did exist, Philips used to make one. 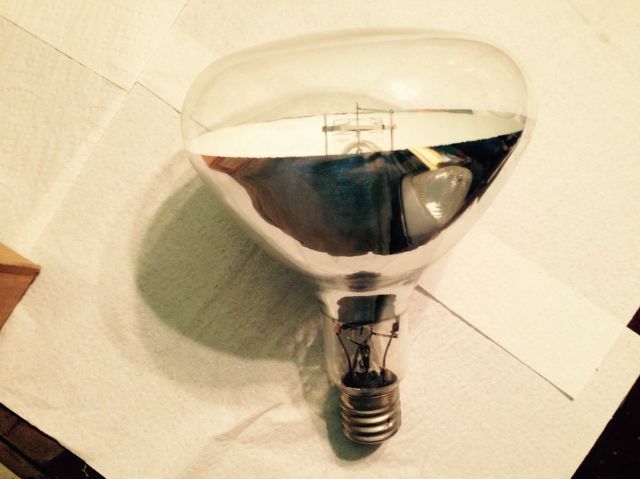 Wow, I didn't realize reflector mercury lamps were made in this size and wattage! Pride and quality workmanship should lie behind manufacturing, not greed. Dude they went all the way to 1000w! The reflector lamp came in an R-80 size, equivalent to 10 inches diameter. Looks like both silver and phosphor coated reflector here respectfully. They made a 1KW R80? Wow! I have a beautiful near NOS (used it a little back in the lats '80's) Westinghouse H33-1 FS/C lamp like this GE, but with the "bump" to support the frame. It is same layout, clear face, /C phosphor coated reflector, oddly no Lifeguard on the etch, but it has Lifeguard electrodes. Gorgeous lamp! I also have a Sylvania R-60 SPOT 400 watter, clear face, NO phosphor, and narrow spot beam! NOS. I have 2 R-80 1000 watt mercs, one is a Sylvania, /DX with clear face and phosphor coated reflector, the other is a Westinghouse with IF frosted face, NO phosphor, so color of clear lamp lit. I also have the fixture for it, a HUGE bell shaped cast aluminum beast made by either Circle-D or Stonco. It is remote ballasted. We have a Friendly's restaurant here with some of the R-60 400 watt clear face /DX floods in use here, with the ballasts in the building. I also have a 2 lamp Stonco port top unit with fixtures to take these R-60 lamps, currently apart, because of ballast issues (2 lamp SOLA paint can). That is the unit I had the H33-1 FS/C in. Both units came from the same location, a motel n Latham, NY demoed in 1986, and the 1000 watter was on the neon sign lighting the forecourt, the 2 lamper was on a post lighting the side area. I have most of the eon glass from the sign saying "Bel-Mar Motel". All of the units are at The Edison, but the Westinghouse lamp, 400 watter is here still. I love these merc floods--we need to bring these back--LED killers for sure!